Recall that Dr. Edu, the Director General of CRSPCDA rescued the Christiana Etim and her then 16-year-old mother, Esther Etim Effiom during a Maternal and Newborn Child Health Week at Ikot Ekpo Axis of Calabar on. Christy is 3 years old. Like yesterday I clearly remember when I thought it was a dead small dog lying on a dirty veranda. I told the state nutrition officer who was with me on a community sweep seeking for malnourished children, that we will not go into that compound because I don’t want any rabies infected dog to bite me since one was dead already another could be by the side. 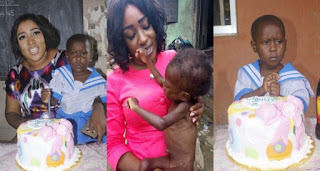 This is the story of A young girl, Christy who overpowered severe malnutrition courtesy of the divine intervention of Dr Betta Edu who God used in rescuing her 3 years back. The girl with bones sticking out of her ribs generated sympathy around the State with a few persons notably Mr Richard Akinaka, volunteering to support care for their needs and education. The two have been through several hospital admissions in the build back process but we are happy for progress made so far. Now, that girl is so beautiful, strong and healthy. The malnourished girl, who survived severe pains as a child, is gradually gaining her footing in society, She is now grown and has turned into a beautiful young child. But asides the beauty, she’s also got brains and very smart. She hardly smiles…May be life didn’t smile at her at birth. Presently, she is in nursery school. According to the teenage mother who is also enrolled in a secondary school, she dreams of little Christy and her becoming a medical doctor so the can help other kids who are currently going through what she went through all those years.